This article will take a closer look at what makes North Carolina's manufacturing sector tick, delving into specific site selection factors. We'll examine the state's outlook in light of recent changes such as tax reform and import tariffs, and chronicle North Carolina's remarkable recovery from the recession. North Carolina’s textile/apparel sector continued on a downward slide, with jobs 1.6% in 2017. The sector remains one of the state’s largest, however, employing 54,046. Most of North Carolina’s top industries added jobs as well, with industrial machinery growing by 1.3%; and food processing by a half percent. Industrial machinery ranks first in North Carolina for number of jobs, employing 63,176, while food processing ranks second, with 61,446. 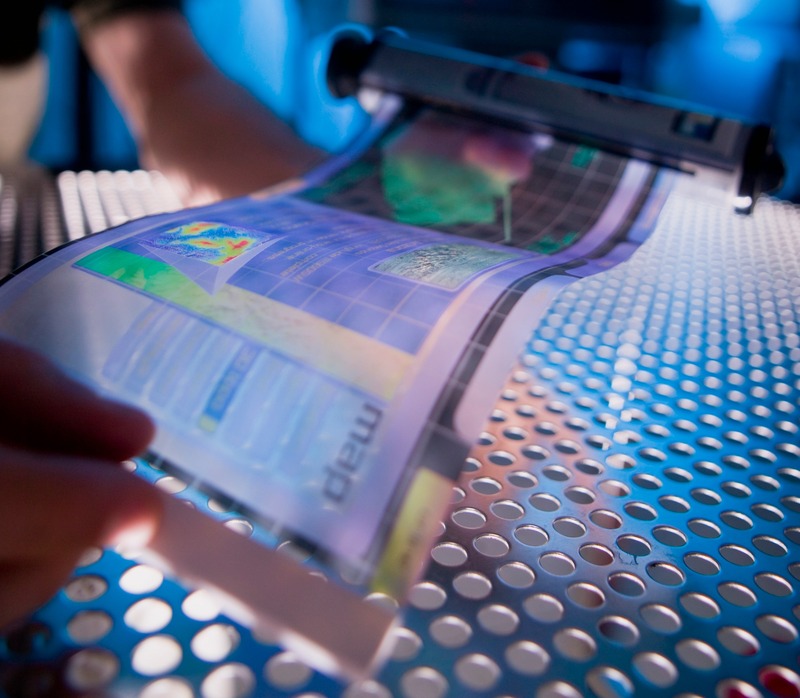 Other gains were reported in instruments/related products; furniture/fixtures; paper products; and fabricated metals. Taking a look at regional data, IndustryNet shows North Carolina’s manufacturing sector has strengthened across the board, with job up 2.4% in the Southwest; 1.5% in both the Northwest and Southeast; and 1.4% in the Northeast region. Most of North Carolina’s major industrial cities fared well over the year, with significant gains recorded for Charlotte and Winston-Salem. Over the past year we saw a number of new plant announcements, which bodes well for the North Carolina’s manufacturing sector going forward. Most notably, Chinese tire manufacturer Triangle Tyre Company unveiled plans to open two tire plants in Edgemore County, investing $580 million and eventually employing 800 North Carolina workers. We also saw the establishment of MKT Metal MFG in Wilson, and EGGER Wood Products in Triad. Carol Poultry broke ground on a processing plant in Bladenboro, and shower enclosures manufacturer Quality Enclosures established a facility in Albemarele. And although North Carolina’s textile/apparel sector continued to lose jobs in 2017, one bright spot for the industry was Fiber Innovations’ acquisition of DuraFiber’s shuttered “Shelby” factory in Grover. Although North Carolina is not a major steel/aluminum importer, with these raw materials accounting for less than 1% of the state’s total imports, the effects of the new import tariffs enacted by the Trump administration may nonetheless have a significant impact. MarketWatch estimates 173,000 North Carolina workers are employed by companies that rely on steel and aluminum imports. The aluminum tariffs could also hit the state’s microbrewing industry. North Carolina has a thriving beer brewing industry, home to 52 microbreweries, many of which would rely on imported aluminum imports for the manufacture of beer cans. The potential for retaliatory trade measures has also been a top concern among North Carolina manufacturers. The state’s pork producers are especially concerned as China continues to enact new tariffs on American goods such as pork and fruit. At the same time, North Carolina’s steel producers stand to benefit from the new import tariffs, as more companies begin to source domestic steel. Charlotte-based Nucor Steel, for instance, recently applauded the administration’s move to stem the flow of “steel dumping” in the U.S. market. Tax reform is also bound to have a major impact on North Carolina manufacturers, with the sweeping changes expected to spur investment among the nation’s manufacturers. 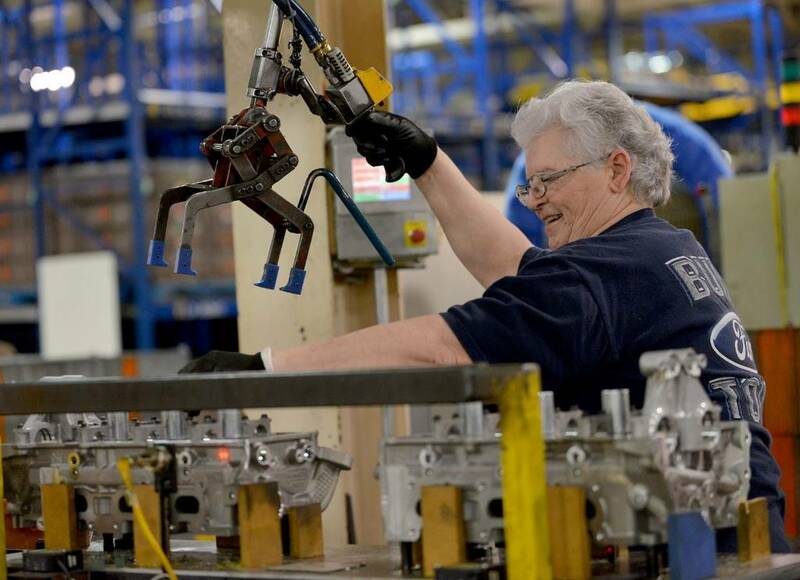 Largely thought to be a direct result of the sweeping reform, optimism among U.S. manufacturers stands at an all-time high, according to the National Association of Manufacturers. A number of recent economic reports continue to point to accelerating U.S. manufacturing growth. As the nation’s industrial sector continues to show signs of rapid growth, North Carolina is in many ways uniquely poised to benefit from the sector’s upswing, as more and more manufacturers, both foreign and domestic, choose to set up shop in Tar Heel State. North Carolina recently ranked as the nation’s best state for business, according to Forbes 2017 Best States for Business report – the only state in the U.S. to remain in the top five states for business over a twelve-year period. North Carolina’s low cost of doing business is listed among the main reasons for the top honor, as well as its highly educated workforce and abundance business incentives. These factors have helped foster growth in North Carolina’s more traditional industries such as industrial machinery and transportation equipment, but have been especially instrumental in drawing high-tech enterprises to the state. Much of North Carolina’s industrial innovation has been fueled by its famed Research Triangle Park, the largest research area in the United States. RTP is bordered by three universities and is home to more than 100 research companies, involved in a variety of high-tech enterprises, from pharmaceuticals to electronics. North Carolina’s strong research focus has earned it a consistent top spot for innovation in the U.S., most recently ranking 6th in the nation for technology and innovation by CNBC's Best States for Business list. The state’s pro-business environment has been recognized by a number of similar studies, including a top ranking for state competitiveness by Site Selection, and first for lowest state and local business tax burden by Ernst & Young. The state also boasts an abundance of capital and shovel-ready sites, as well top notch incentives such as the One North Carolina Fund, Job Development Investment Grants; and County Development Tier Designations. In conclusion, North Carolina boasts a rich and diverse industrial sector, and multiple signs point to growth in the comping years– yet climbing back from the recession was a struggle for the state. Next, we’ll take a look at the rise of North Carolina’s industrial sector in the years following the recession, based on developments tracked by IndustryNet. A decade ago, North Carolina was home to 11,725 manufacturers employing 638,117. Those numbers declined precipitously during the recession. By December of 2010 the number of companies dwindled to 10,507 and manufacturing jobs levels fell to 549,249. Overall, North Carolina lost 94,000 jobs during the recession. 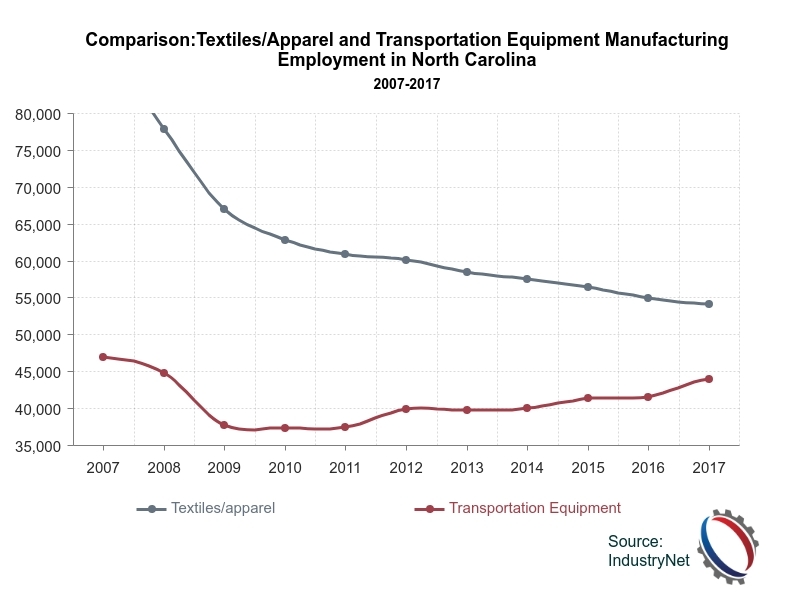 Textiles/apparel, historically North Carolina’s largest sector by manufacturing employment, lost about a third of its jobs over this time frame. Layoffs and plant closings had begun to slow between 2009 and 2010, and in 2011, IndustryNet recorded its first gain for the state. North Carolina added 1,587 industrial jobs in 2011 -- the first gain reported for the state since 2006. Gains were reported across multiple sectors and were strongest in industrial machinery; fabricated metals; paper products; electronics and chemicals. Bright spots over the year included the opening of a Novartis vaccine manufacturing plant in Holly Springs and the establishment of a new Caterpillar plant in Winston-Salem. In addition, Cooper-Standard Automotive announced an expansion of its Goldsboro auto-supply facility; Merck expanded its Durham vaccine plant; while CMS Food Solutions announced plans to open a biotech manufacturing site in Leland. Finally, Medicago opened a biotech plant in Research Triangle Park, for the purpose of manufacturing flu vaccines from tobacco plants. The state’s textile/apparel sector, which at the time ranked second in the state for industrial jobs, shed 2% of its workforce after major operations like Mohawk Industries and Dodger Industries shut down. Food processing also declined in this year, with the shuttering of Townsends, Inc.’s chicken processing plants in Siler City and Mocksville and the closure of ConAgra’s Slim Jim plant in Garner. North Carolina’s manufacturing sector thrived in this year, adding 7,300 jobs to its manufacturing workforce. This was the first year IndustryNet recorded a notable gain for the state in a decade. Gains were led by the state’s transportation industry, which rose by 6.4% as the auto bailout helped many of the state’s manufacturer recoup some losses. Employment also strengthened in medical instruments/related products, which surged 7.2% as the state continued to secure its reputation as a center for innovation. Additional gains were seen in chemicals; industrial machinery; food processing; and electronics. Several manufacturing companies announced openings and expansions in North Carolina that year, including computer giant Lenovo, which unveiled plans to locate its first U.S. manufacturing facility in Whitsett, and Herbalife, which made plans to open a facility in Winston Salem’s previously shuttered Dell facility. Semprius established a new solar panel plant in Henderson; auto supplier Linamar expanded its facility in Arden; Swiss manufacturer ABB broke ground on a grid cable facility in Huntersville; and Deere-Hitachi announced plans to expand its Kernersville factory. North Carolina added manufacturing jobs in 2013 – but at a much slower rate than reported in 2012. Employment inched up by just 800 jobs. 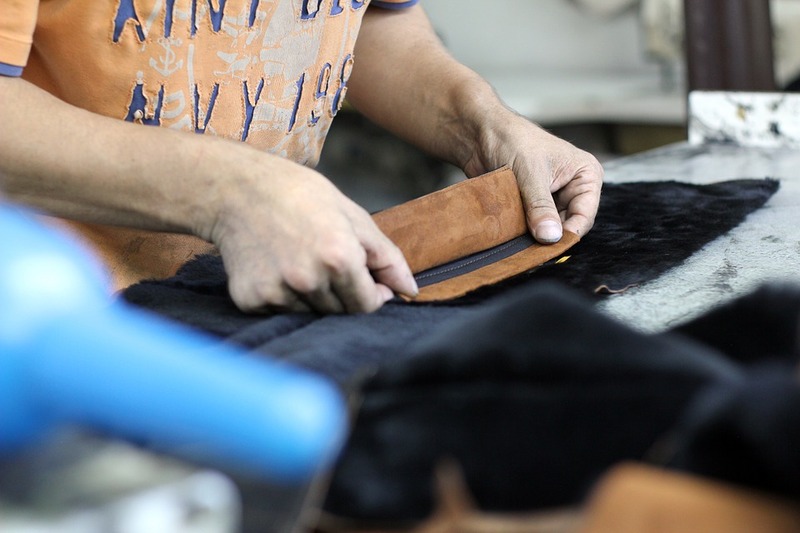 Though a number of the state’s manufacturing sectors continued to add significant numbers of jobs, losses in textiles/apparel outweighed these gains. The industry lost 1,595 jobs, following the closure of a Gildan Activewear site in Newton, Gulistan’s carpet-making plant in Aberdeen, and DAK Americas’ Navassa site. In addition, major industries in the state like industrial machinery and food processing, saw little to no change in employment. Just three sectors: rubber/plastics; chemicals; and fabricated metals, reported an uptick in jobs. A number of new manufacturers broke ground in North Carolina in 2013, however, including biofuels manufacturer Biochemtex, firearms maker Sturm, Ruger & Co., solar panel makers Semprius and Solar Connection, furniture manufacturer BuzziSpace. In addition, we saw the establishment of GE Aviation, Armstrong Marine, Purdue Pharma, and Eclipse Automation. 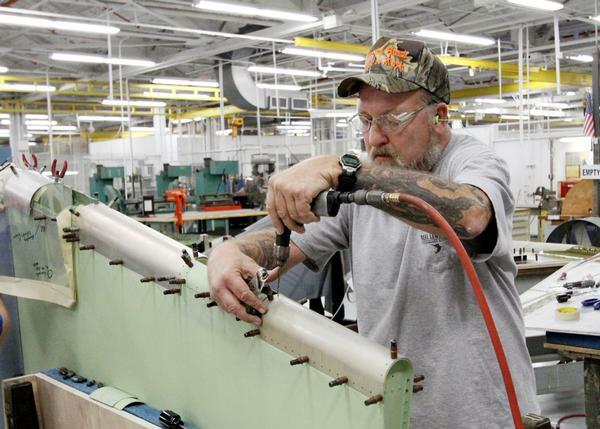 In this year, North Carolina gained four times the number of manufacturing jobs gained in 2013. According to IndustryNet data, the state added 3,700 jobs, or about one half one percent. Gains were led by the industrial machinery sector, which inched up 1% in 2014 to 67,459 jobs. 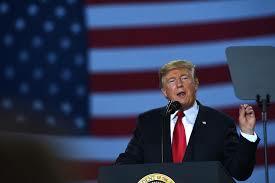 Medical instruments/related products also continued to add jobs, up 3.2%, while gains were also reported in chemicals; fabricated metals; electronics; and paper products. Losses were reported in primary metals, down 6%, and textiles/apparel, down 1.1%. Employment in food processing fell a half percent following the closure of Bruce Foods’ sweet potato processing plant in Wilson, and the shuttering of House of Raeford’s turkey plant in Raeford. IndustryNet also recorded strong gains in medical instruments/related products; chemical products; and food processing. The future looked a little brighter for food processing, however, once Butterball moved forward with its plans to reopen the House of Raeford plant, bringing an estimated 367 jobs to the state, and Jimbo’s Jumbos expanded its peanut facility in Edenton. Other bright spots for the state include the opening of start-up Alevo’s $1 billion battery plant in Concord (though that location would eventually close). In addition, we saw the establishment of a new GE Aviation plant near Asheville; and the expansion of International Paper’s mill in Riegelwood. In this year, manufacturing job gains accelerated in North Carolina, with the state adding another 5,900 jobs or 1.1%. The state’s top sectors all added jobs in 2014, while employment strengthened across numerous other sectors. Several manufacturers announced openings in North Carolina over the year, including Germany-based Raumedic, which established a medical components facility in Mills River; and CNG fuel systems manufacturer Agility, which opened a $20 million factory in Salisbury. The state’s long-ailing textiles/apparel sector added jobs for the first time in more than a decade – up 1%, while transportation continued to speed ahead, adding 3.4%. Manufacturing job growth once again stalled in this year, with North Carolina adding jobs at a tepid rate. Jobs edged up by just 721 – less than half of one percent. As with many states across the nation, global competition and a strong dollar continued to hit the state’s industrial sector. We saw the shuttering of MillerCoors’ brewery in Eden in this year, as well as and Flextronics’ electronics facility in Charlotte. In addition, auto-glass maker Safelite ceased operations at its factory in Enfield and ConvaTec closed its Greensboro plant. Although food processing posted a modest gain in this year, as did rubber/plastics and chemicals; the state’s industrial machinery sector shed 4.4% of its workforce, and textiles/apparel shed 2.3%. Several companies announced new operations in North Carolina that year, including Sanderson Farms, which opened a chicken processing plant in St. Pauls, and HUESKER, which -broke ground on a new geosynthetic plant in Shelby. A few new textile plants announced hiring plans that year, including Taiwan-based Everest Textile, which unveiled plans to open a plant in Forest City. King Charles Industries also established a performance fabric facility in Anson County; while Carolina Nonwovens moved operations to a larger manufacturing location in Maiden. Next, we’ll take a closer look at North Carolina’s manufacturing sector as it is now, exploring its major industrial cities and regions, as well as its top companies. IndustryNet’s team of more than 80 researchers scours hundreds of sources on-and-offline to zero in on every manufacturer in the U.S. Each manufacturer is contacted multiple times annually to ensure its information remains up-to-date and complete. Our state-by-state industrial employment surveys are based on this data, allowing us to compare jobs counts in a given industry, state, region or city from year to year. To access detailed profiles of North Carolina’s 10,000 industrial companies and their 33,000 executives, learn more about our EZ Select database subscription. Or, to connect with industrial suppliers in North Carolina and across the U.S. start your free search on IndustryNet. IndustryNet allows users to search and source more than ten thousand types of products, parts, supplies, and services for free. IndustryNet® lists every U.S. manufacturer plus thousands of wholesalers & distributors and industrial service providers.